Our Private tours are suitable for families with young children, couples or small groups. All our bike tours could also be offered as “private” providing greater flexibility for starting time and duration. Let us know what you are interested in and we will customize a tour for you. Have fun while cycling and uncovering the charms of Athens with the most popular morning city bike tour. Ride around the historic center at a relaxed pace, using a safe route far away from traffic. You will get to know Athens from a different point of view, passing by all the must see locations and many hidden spots. Athens transforms in the afternoon to a picturesque paradise and the city’s beauties are presented in a variety of unique colours. The Ancient temples and the historic monuments glitter in the light of the setting sun, creating an amazing scenery that invites you to join in and discover hidden secrets and breathtaking views! Designed to give you the best lighting conditions, this is an ideal tour for photography enthusiasts. Did you see everything in the city center and now it’s time for something more? Then it’s time for our coastal tour! Getting some exercise as well as seeing parts of the city that you may have missed, this tour is a perfect half day activity. Starting from Athens city center, we cycle through quiet neighborhoods, on safe bike lanes, to reach Athens “Riviera”. Are you ready to experience as much as you can get from our city? If the answer is yes, then this tour is for you! Additional time ensures that at the end of this tour, you will have a plethora of unforgettable memories and amazing sceneries of Athens. Children have a unique way of looking at the world. 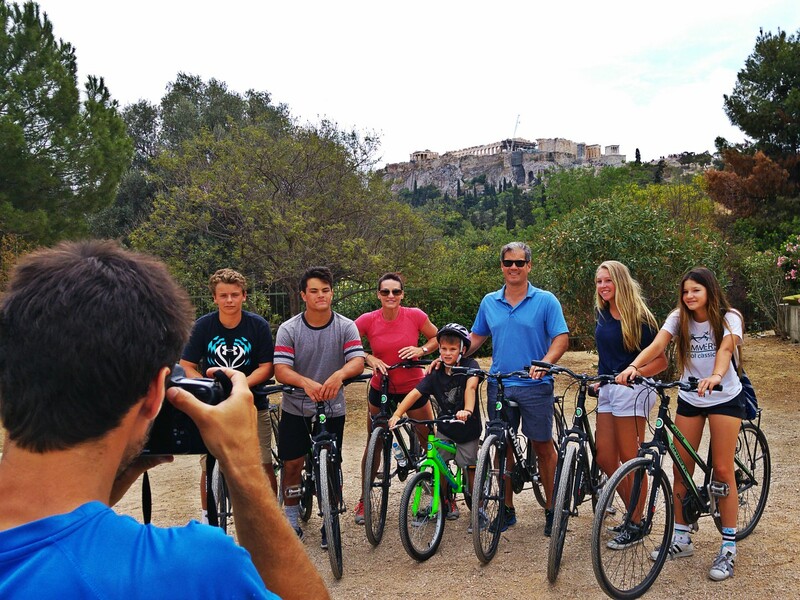 We’ve developed many ways to make a bike tour of Athens exciting and fun for the entire family. This way parents and children have a great time! These bike tours are suitable for families with children between the ages of 6 and 17. Our tour leaders customize the bike tour based on the age, interests and stamina of the youngsters involved. Children’s bikes are available in a variety of sizes. For toddlers and kids up to 25 kilos we can provide bikes with children’s seats.